That tactics are toned down, the bloody militarism is too, but the mindset is the same. In 1917 the Bolsheviks couldn’t get their way, so they just started a reign of murder and terror until they did. They were able to keep it up for about a century. Mao and his murderers in China couldn’t get their way, so they started a reign of murder and terror until they did. The tactics of the Left have changed. Now they have protests, often leading to violence of a lesser sort than Lenin and Mao engaged in, and a perfect example is what’s happening in Wisconsin now. I guess it could just be called intimidation and bullying instead of a violent revolution. They're going for the same result. Make sure they have the money and power, and that the citizens obey them. The governor of Wisconsin, Scott Walker, when he was running for office, said he would make major budget cuts and curtail the power of the unions. Most unions members are government employees, and think that no matter what the economic situation of a state or the country; the citizens should be taxed so they can maintain their life styles. The same citizens that are losing their homes, taking wage and salary cuts, and getting laid off. The citizens liked what they heard Walker and other Republicans say they were going to do to address the $billions of debt Wisconsin is facing, and so elected them. Now these employees aren’t showing up for work, and are going to the state capitol building and protesting; twenty-five thousand of them the first day of the demonstrations. This is a great message for the teachers to relay to kids…don’t like the way things are going, don’t show up for work and have a temper tantrum. Despite what their union, the National Education Association (NEA) says, teachers aren't about the kids, teachers are about how they can benefit themselves. If that weren't so, they they would have shown up to work. (To teach, one must be a union member, union thuggery, so those teachers that are coerced to join don't fit that observation.) Which is what the Democrat legislators have done; not show up. They fled the state instead of debating and voting as they were hired by the citizens to do. They had to flee the state because the state police were looking for them, to arrest and take them back to the capitol. They can’t cross state lines to effect the arrests. There are 19 Republicans in the legislature and 14 Democrats. Twenty are needed for a quorum. The governor has proposed to eliminate collective bargaining rights for state employees, require employees to pay for half of their pensions and at least 12.6 percent of their health insurance. Wage increases would be tied to the Consumer Price Index. Union negotiations would be limited to wages. This is what the legislators were to debate and vote on. For this the Governor and Republicans are called all sorts of nasty things. The state just doesn’t have the money to continue to pay all those benefits and wages. Many retirement packages provide a higher annual income than the employee made while working, and for more years than he\she worked. The governor can’t do what Obama does, borrow and print $trillions and pretend it’s not such a big deal. Something else Obama and the Democrats and their union thugs have done (the two main sources of funds for the Democrats are George Soros and unions) is send in Leftists from all over the country to join the protesters. A wing of the Democrat Party, and the campaign organization for Obama, Organizing for America, is the coordinator in this attack on a state, doing its own state business. The federal government has no jurisdiction here; this is only a Leninist political maneuver, led by the president, who is elected to represent all the people, not just unions and his other political supporters. Obama called what Governor Walker is doing “an assault on unions”. It’s none of Obama’s damned business. Walker’s response: "I think we're focused on balancing our budget. It would be wise for the president and others in Washington to focus on balancing their budget, which they're a long ways from doing." 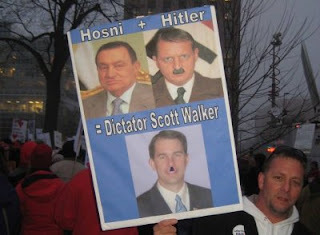 What’s happening in Wisconsin is a microcosm of the tipping point we face. Do the unions and their political sock puppets demand we the people pay up to sustain their power and life styles, or are the Citizens in fact the government, and tell the unions and congress critters they’ll take what they're given and shut the hell up or quit. The cowardly Wisconsin Democrats fled the state rather than do what they’re paid to do. State (Leftist) employees took to the streets rather than go to work and do what they were paid to do. There’s the difference. Conservatives took the legal and moral path, and were called fascists, Nazis, violent, etc., and the Leftists are in fact engaging in fascist, Nazi, Leninist behavior because they’re losing the argument and power. Lot’s of signs by the way, and we’re not surprised, of the Governor with a Hitler mustache. The tactics have softened, but the intent is there. We’re at tipping point. Marx and Engels with the Communist Manifesto, or Jefferson and Washington with the US Constitution? Interesting article.I love to visit your blog again and again. As a Brit, I am with you. We in Britain have a similar problem with the goonie-lefties. Unfortunately we don't have a politician, like Scott Walker, with a spine - only ones with a yellow streak down the middle instead of one! Have never understood why lefties cannot understand you can't spend what you haven't got! Plus there is the point that if public employees enjoy a first class perks, privileges and pension scheme, why should they not contribute to it? After all, they are employees/managers of public services - what do they actually produce, financially, to the wealth of the nation?